Syria’s UN Ambassador says if Security Council doesn’t act against Israeli attacks on his country, Syria will retaliate. Syria’s Ambassador to the United Nations, Bashar Jaafari, on Tuesday threatened that if the Security Council did not act to stop the Israeli attacks on his country, Syria would have to retaliate and attack the Ben-Gurion Airport. Speaking at a Security Council meeting on the Middle East, Jaafari said that the time had come for the Council to take the necessary steps to stop the Israeli attacks. If the UN Security Council didn’t adopt measures to halt the Israeli repeated aggressions on the Syrian lands, Syria would practice “its legitimate right of self-defense and respond to the Israeli aggression on Damascus International Airport in the same way on Tel Aviv Airport,” he said, in comments quoted by the official Syrian SANA news agency. 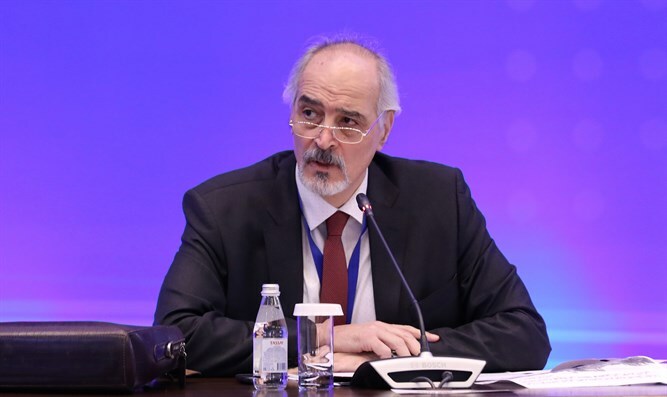 “Isn’t time now for the UN Security council to stop the Israeli repeated aggressions on the Syrian Arab republic territories,” continued Jaafari, who affirmed that the restoration of the Golan is a firm right for Syria which can’t be negotiable or abolished through prescription. The Syrian envoy’s comments follow this week’s Israeli air strikes against Iranian targets in Damascus. The attacks on Quds Force targets were carried out in response to the launching of a surface-to-surface rocket that was carried out on Sunday by Iranian Quds forces operating in Syrian territory into Israeli territory and was aimed at the northern Golan Heights. The IDF’s Iron Dome aerial defense system intercepted the rocket. The targets hit by the Israeli attack included Syrian-operated air defense systems and Iranian munitions depots, an intelligence site, and an Iranian-operated military training camp. Prime Minister Binyamin Netanyahu warned Iran and Syria on Monday that Israel will not tolerate “acts of aggression”, nor will it accept Iran’s continued presence on Syrian soil. “Last night the air force strongly attacked Iranian targets in Syria after Iran launched a missile from there at our territory,” Netanyahu said. “We will not ignore such acts of aggression as Iran attempts to entrench itself militarily in Syria and given explicit statements by Iran that it intends to destroy Israel, as the commander of the Iranian air force has just said,” Netanyahu continued, referring to comments by Aziz Nasirzadeh, the commander of the Iranian air force. Fatah official calls for escalation of 'popular struggle' Azzam al-Ahmad says that now is the time to escalate the "popular struggle" in support of the terrorists imprisoned in Israel.